ECCO Cool Pro review: a spikeless golf shoe you can wear all year. Ecco have merged two of their greatest products in the Cool Pro – it’s like City getting Pep on board. Minus the late season stumble. The spiked ECCO Cool – lathered with praise by us in the past – is a top performing product, and by producing it in this new spikeless option, the Danish brand are opening their net to potentially catch more Cool customers. Same old school basketball vibe we saw in the original Cool. It’s a solid looking shoe, available in different colour options. The holes that run through the bottom of the shoe are a fun design. Put the cleated Cool up against the spikeless Cool Pro and we don’t think you’ll be able to tell the difference regarding grip. ECCO’s Spyder Grip system is so proficient and the traction it provides is so high, we’ve been wearing them through this turgid winter and had no issues. In fact, we’re ready to argue that when it’s really wet, the tech works even better than spikes as it is designed to shed mud and grass, unlike spikes which easily get clogged up. So it’s no longer as simple as saying ‘spikes for winter, spikeless for summer’. Another reason these work 12 months of the year is the waterproof technology. Gore-Tex lend their expertise guaranteeing complete protection, while the holes through the base of the shoe add another layer of breathability. ECCO have designed the shoe to have some extra wiggle room in the toe end, which stops your feet feeling cramped. They’re supremely comfortable, but are also very stable and durable. They feel rigid enough to offer maximum energy transfer through the swing – you know, for those booming drives. 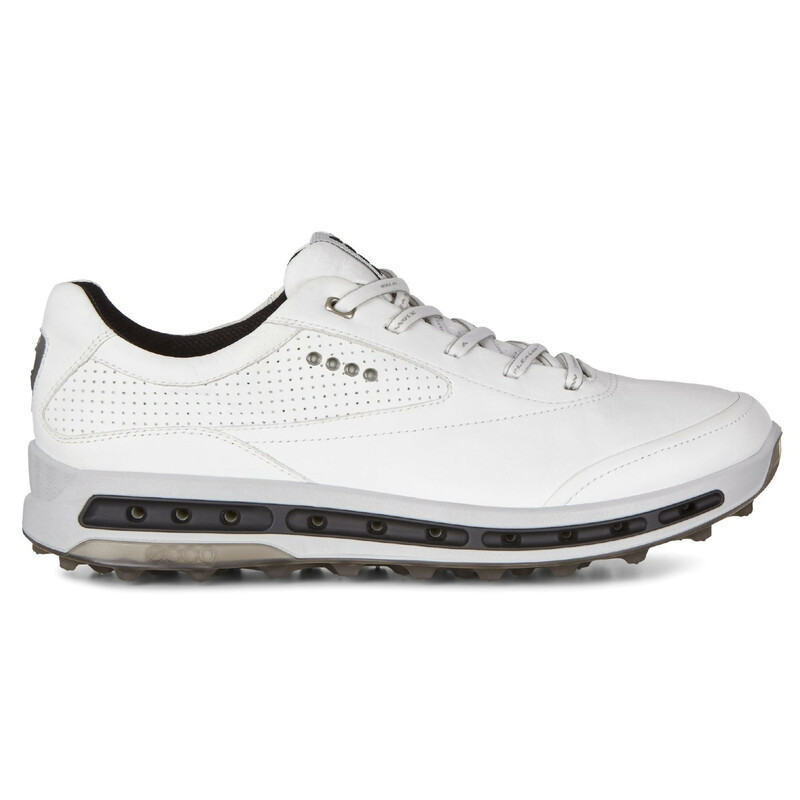 A world class golf shoe gets the best spikeless technology available. The ECCO Cool Pro can be worn all year, as it has excellent traction, waterproof protection and comfort.